A few years ago, I spoke in front of a small audience at an event called, “Passion Into Profits”, that focused on – you guessed it – turning your personal passions into profitable ventures. I had just finished relaying my story about making the film, “The Tapping Solution” and what an outrageous and incredible journey that had been. I was emphasizing the point that during the process I used EFT with every new challenge that came up, every new frustration, and every new setback that normally would have left me feeling powerless and stuck. If I hadn’t had tapping available to me through the process of making the film, there would have been countless points along the way where I might have simply stopped, given up, or gone in the wrong direction. I also focused my talk on only looking at “the next step”, whatever was directly in front of me and needed to be accomplished next in order to move the project forward. When I came up with the idea of making the movie, my first question was, “Who can I get to join and support me in this vision?” Once that was answered, the next question was, “What kind of equipment do we need to film a movie?” I then took the necessary actions to answer this question and continued to move the project forward. I guess I wasn’t clear enough on the importance of this, because sure enough, the first question from the audience completely ignored the Next Step philosophy! Can you guess what my reply was? That’s not the next step! The next step is to work on the script, the next step is to record the CD, the next step is to do the artwork for the CD, not the step she was jumping to. She felt stuck because she had moved too far down the line in her vision and was focused on something that was simply not important at the time. I see this happen again and again with any goal, vision, or dream. It’s important to see the end goal, the grand theme, the big vision, but once you see that clearly, then you just have to take the next step in front of you. What’s amazing about using EFT with this strategy is that it works perfectly on addressing just that: The next step, the next obstacle, what’s in front of you right now! The lady who asked me that question could have even tapped on, “Even though I don’t know how to make the CD and I’m overwhelmed…” and once she did that, she herself would have recognized that everything was OK and she just needed to focus on the next step. Tapping diminishes the “noise” that surrounds us and increases the mental, emotional, and even physical responses we produce when faced with life challenges. Goals, visions, and dreams these days tend to be complicated by the speed of modern life, the speed of email communications, the constant interruptions, so the overwhelm can be too much and can paralyze you. Here’s a great Tapping Meditation from our Tapping Solution App that can help! Use this important and simple tool to quiet that noise, move yourself to a place of peace, and from there you’ll have the resources to make the best decisions and take the next step. What’s in your way right now? Have you used tapping to overcome overwhelm or procrastination? Share below! Thank you so much for this, Nick!! I could feel a big difference at the end of this, and I have been living in a constant state of overwhelm for a very long time. I am so very grateful to have found something in my decades long search that is FINALLY getting to these deep areas of conflict and pain in my being. The process has been difficult and painful for me at times, which in my case I would expect. But staying with it has helped me a great deal and I know I’m now gaining some traction. 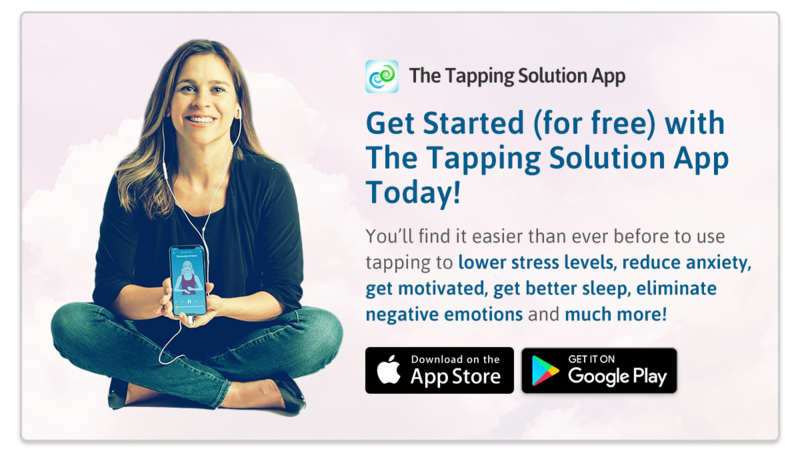 Thank you so much for this tapping meditation – going thru some serious health issues right now and found this so very helpful. Blessings. Always helpful.Thankful for finding this tapping solution today. A perfect time to receive this email and read this blog about the next step. I woke up this morning overwhelmed and this helped me to stop pause, tap and think of what was next on each project and task. Thank you! I feel tearful and very tired. Tapping is a great tool to handle emotional issues, I must say you are doing a great job in spreading awareness about it, with all your useful audio/videos. I am doing my bit to spread awareness about EFT here in Bangalore India. Thanks and appreciate your good work. That is wonderful, BR! Thanks for helping to spread the word about Tapping! Thank you so much for teaching me about tapping. My own Captain Kangaroo moment stands out and still impacts me today (hopefully won’t impact my tomorrow as I’ll tap on it soon). I loved art as a child and wanted to be an artist. My art teacher in 3rd grade yelled at me during an art class and called me out in front of everyone for doing a poor job. She was also my piano teacher and I counted on her opinion a lot. So, at that moment, I “learned” that I could not do art. Ever since, I have gotten a tight feeling in my chest whenever I come close to thinking “I want to do art.” I plan to stop that with tapping! I also would love to attend the 7-week seminar series after having experienced the financial webinar last week, but I’m not seeing how to access that anymore. Tapping, I am convinced, is the hidden gem that can turn around our suffering society! Nick, this is for Jessica, I did not see a comment section after that profound meditation on finances. I did not do finances but I altered the words to improve my health and the energy surge is truly amazing, I haven’t had this much energy in 10 years, thank you ever so much. I am using tapping now as I am worried about finances too much, I have what I need though. Also I have been given to opportunity to work for a salary and do work I really will enjoy, but am a bit anxious about. I know I can do the work, am alredy doing it on a volunteer basis, but not regularly. So I use tapping to reassure myself all will be fine, and I know it will. just need to keep tapping to releave myself of worry. Nick, thank you, thank you, thank you! This morning I woke to all the normal chaos going on in my head, I then read your article that clearly changed my whole thinking! I also did my first tapping on my financial insecurities and in the space of half hour felt for the first time in such a long while that everything is going to be fine! I now feel excited about my next step in my new project and believe that my current financial status will change for the better. I will now be bringing tapping into my life full time. I feel very lifted. This is such a fantastic method to bring peace and harmony in the heart, and whole body. Great tool for instant results to get rid of anxiety and stress which allows us have clarity and focus on solving the problem rather than worried about it. I have an amazing experience to share with you. i was lucky enough to get a random e-mail from a friend just before the 2012 summit which my sister and I watched together. We watched and tapped along with all the guests you presented. A week before the summit was over my sister had to go care for her sons cats while he went on vacation (I emailed the rest to her so she wouldn’t miss any) so I was left to my own devices, so I tapped and tapped and spoke to the Universe for four (4) days from the time I woke up to when I went to bed (obviously I had a few issues) and ended up clearing 90% of those issues. Now the interesting part. I am a pet nanny and the dog I was caring for at the time of all this was carrying it’s tail between his legs tightly and having trouble walking (I knew he was in a lot of pain). The owner said he had medication for his Arthritis if he needs it. The first day after all my chores were done I sat down on the floor next to him and began tapping. I did this twice a day for the ten days I cared for him. I tapped and spoke to the Universe to rid him of his pain and to take away his Arthritis. On the fourth day I noticed his tail was more relaxed, letting me know he was not in as much pain, he gave me a BIG smile at the door and he was moving much more easily. I was very pleased and delighted I could do this for him. So then from there I was going to my next job not thinking of much, just really happy the dog felt better, when suddenly I got goose bumps through my entire body and it wasn’t just once, as soon as they subsided it started all over again. This happened about four continuous times over and over and the Universe was not done with me yet because as soon as my major goosebumps subsided tears stared rolling down my face. I couldn’t control them and I couldn’t stop them but because I was on a country winding road I had to continue to drive until I could pull off the road, and thank goodness the Universe did not disrupt my vision until I was safely off the road. Once I was safe I realized the tears were not of sadness, they were tears of joy. I was smiling and I felt so, so much lighter and felt and saw so much bright light all around me. It was incredible. I hope everyone in the World has a chance to feel what I did that day. But my story is not over yet. By the tenth day of caring for this beautiful dog, he was hopping around wanting to play and running to the back door to be let out, smiling the whole time ( he couldn’t do that before). I thanked the Universe for everything it had done for this dog and I was very happy to be leaving him to his owner better than when I first came. While I was walking to my truck I noticed I was no longer in pain myself. I had Arthritis also from a partial knee replacement and was on medication for it. I was so amazed, and at first could not believe it, so I tested it and tested it and on that day I stopped taking my medication and haven’t needed it since. I realized that as the Universe and I were concentrating on healing the dog we also healed me. Thank you so very much for introducing me to the Tapping World. I love it and will never be without it. My next step is to watch the Tapping DVD! I purchased it and have recieved it, but havent watched it yet. I’m going to do that right now. I pray that this will release me from all the gunk I have carried all these 45 years of my life. I had a violent childhood, failed marriage of 17 years, anger, anxiety and I am reading you can heal your life because I do want to change-so badly.